World Human history is reputed to have taken off around 50,000 years ago. The earliest definite signs of this Great Leap Forward come from East African sites with standardized stone tools and the first preserved jewelry (ostrich-shell beads). Similar developments soon appear in the Middle East and in south-eastern Europe, then (some 40,000 years ago) in south-western Europe, where abundant artifacts are associated with fully modern skeletons of people termed Cro-Magnons. Cro-Magnons garbage heaps yield not only stone tools but also tools of bone, whose suitability for shaping (for instance to fish-hooks) had apparently gone unrecognized by previous humans in Europe. Then about 8000 BC a new light dawned in the Middle East along what is known by historians as the ‘Fertile Crescent’ – a crescent-shaped region stretching from just south of modern-day Jerusalem then northward along the Mediterranean coast to present-day Israel, Palestine, Jordan, Syria and eastward through present-day Iraq then southward along the Tigris and Euphrates rivers to the Persian Gulf. 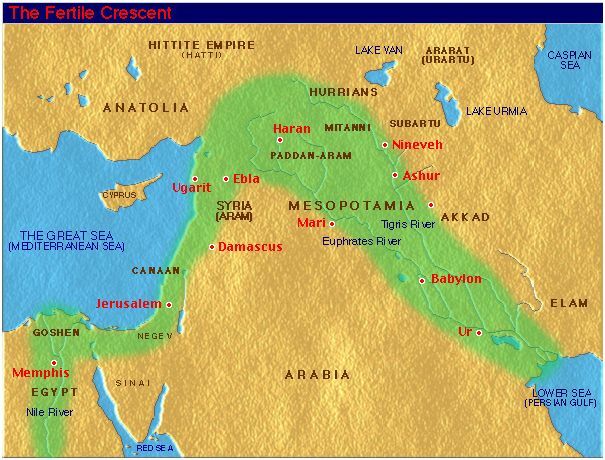 Initially, the Fertile Crescent was only sparsely inhabited, it was in this fertile valley that agriculture was first believed to have been developed. Wild wheat and barley grew in abundance and tribes of nomad hunters and herders began to settle down along the lush banks of the rivers and became the world’s first farmers. Agriculture was the spark which lit the flame of European civilization. Farming gave rise to social planning on a larger scale as groups of nomadic tribes settled down and joined co-operative forces. Irrigation developed as the need increased to feed and support growing populations. Soon towns were built to afford comfort and protection for these early settlers. Towns like Jericho, Jarmo, Ali Kosh, Catal Huyuk, Beidha and Hassuna were the basis of a new form of human social organization and became the foundation for the first civilization. At the Fertile Crescent they found out also that wheat and barley could be stored if it was dry and so extra areas of the crops could be sown and the population expanded accordingly. Soon they began to grow extra corn, breed extra cows, cattle, sheep, pigs and horses. The technology and the wheat and barley seed was carried by the peoples from that area both east and west to as far as China to the East and Ireland to the West over the following millennia. The spread of farming happened in different ways. In Egypt for example, local hunter gatherers added south Western domesticates, farming and herding techniques to their own diet of wild plants and animals and then gradually phased out wild foods. The same was more than likely true along the Atlantic coast of Europe, where local tribes adopted South West Asian livestock and cereals over the course of many centuries. At the opposite extreme are regions which food production began with the abrupt arrival of new people as well as foreign crops and animals.